Little new emerged today at the arragnment of William Dunn for the murder of 78-year-old Robert Moore, a man everyone seems to have admired. Why nothing new? Because,at least according to the story by the Globe’s John Ellement, Judge Patricia Kurtin sealed the court file. Now, what’s in there? There has to be, at the very least, a complaint and a police statement establishing probable cause to hold Dunn, likely with a fair level of detail about the police investigation to date. Why the secrecy? Are the police concerned that its release will permit other suspects to avoid apprehension? Hardly. The best (though, in fairness, not the only possible) explanation for this move is that the prosecution simply wants to control the flow of information to the public. Why? Because they can, as long as they can find a Judge who will let them get away with spoonfeeding information to reporters. Given the level of interest in this case, the lockdown of the local schools, the arrest of Hillel Neuer as a result of the paranoia that evidently gripped the town, or at least Stone Hearth Pizza, on Friday afternoon, there is absolutely no call for secrecy for these basic court documents. Judge Kurtin’s decision would be unlikely to withstand a legal challenge, but will anyone look to break the seal? We’ll see whether this case is one that the papers really care about. In the meantime, the Globe’s photo of Dunn (that’s him at the top) isn’t going to do anything to discourage talk of an insanity defense. Dunn’s lawyer, Robert Griffin, wisely held his tongue on the courthouse steps. 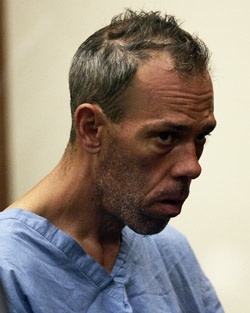 It’s far too early to guess how this case will play out, but it has all the elements of heartbreaking drama–a victim who seems like a wonderful guy, and a defense likely built on the claim that his killer was a deeply, deeply troubled man who is sick, not evil. Stay tuned. The Globe (thank you Mr. and Mrs. Ellement) did a much better job than the Herald this morning reporting on the sad case of the murder of 78-year-old Robert Moore, who was apparently beaten to death in his own cellar by William B. Dunn of Norwood, an employee of Mass Irrigation Company of Quincy, who was at Moore’s home working on Moore’s sprinkler system. The Globe found a Norwood PD report revealing that Dunn was admitted to Carney Hospital for psychiatric treatment in August. Dunn wandered away from the hospital, only to be found by police a day later walking near a Norwood cemetary. No word on what happened after the police returned him to the hospital, or whether Mass Irrigation knew of his difficulties before sending him out to deal with customers. Dunn’s family told police he was laboring under the delusion that he had “stumbled upon a stock scandal and that there were people after him”–a state of mind commonly seen among the staff of the Boston office of the SEC, but presumably less common among sprinkler guys. This may be a case where an insanity defense might actually have some legs. 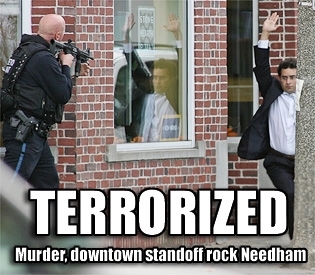 “There should be reason to feel safe in Needham, and there’s no reason to be fearful right now,” Norfolk District Attorney William R. Keating told reporters gathered at the town police station.” So reports the Boston Globe this morning. 6. He talked on his cell phone. So, admittedly, the change in clothes is a little odd, as Republican supporters of Greg Hyatt will no doubt recall, but was the rest of what he did worth turning Needham Center into a Dog Day Afternoon rerun for most of the afternoon? Maybe our friend should have ordered the large pizza–as everyone knows, only real troublemakers order the small ones.